For more information on the ten essentials, go to www.mountaineers.org. Get the Scoop – consult with a guidebook and/or website (such as www.clubtread.com or www.bivouac.com) to select a suitable outing based on your experience, fitness level and time required. If available, check information regarding the trail/route type (mountaineering route, route, secondary trail, primary trail, track, etc.) and also the distance and elevation gain involved. The more detailed the map or guidebook, the better. Also, check the weather forecast and when appropriate, check the avalanche risk at www.avalanche.ca. Hand Over the Plan – leave as much information as possible regarding your trip with at least one person. Contact this person when you get back. If registration is possible at the trailhead, fill this out as well. Join the Club – for the less experienced, never hike alone. Form a group which includes some experienced people. One of the best ways to be part of an experienced group is to join a hiking or mountaineering club such as the BCMC, North Shore Hikers or the Chilliwack Outdoor Club. Stick Together – there is no sense in hiking with a group if you choose to race ahead on your own. Do not leave slower members behind. If you like to race, enter an organized competition. Not a Fashion Statement – use common sense and dress appropriately. Synthetic clothing, multiple thin inner layers, waterproof breathable outer layers, and lug-soled hiking boots are recommended. Also, stow away gloves, sun hat and a toque in your pack. Gear to Invest In – for your general safety and well being. Trekking poles present a huge advantage in providing extra stability and less strain on your knees and back. If you do twist an ankle or injure your legs/knees, having poles could make continued travel possible or much easier. Major creek crossings should not be attempted without poles. Also, communications gear such as a cell phone is highly recommended. Check the service area of your cell phone provider. Satellite phones have become much more affordable recently and at least one phone should be carried per group. Even more affordable is the Spot Tracker, an emergency locator device now commonly available. Also, having a short safety rope (10-15m) can make a big difference in some situations. Other items such as flares, bright colored sheet, mirror and whistle could be used for signaling. Backcountry activities on snow require beacons, probes and shovels for avalanche rescue. If you do spend a fair amount of time in the backcountry you should consider these investments – your life must be worth it! Learn to Orienteer – getting lost is easier than you think. Learn to use a map, compass & GPS. Use the most accurate, detailed maps and guidebooks available. Buy digital topographic maps to download to your GPS. Bring along a GPS (with extra batteries) and create waypoints along the way – if you become lost you can backtrack using these waypoints. 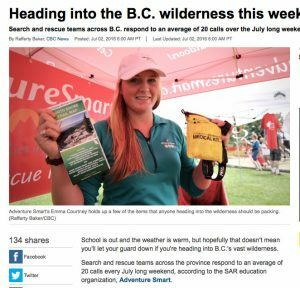 To find an orienteering course go to the Federation of Mountain Clubs of B.C. website www.mountainclubs.org or the Orienteering Association of B.C. at www.orienteeringbc.ca. Learn to Survive, Mountaineer, Climb or Ski – upgrade your skills or learn a new activity. Go to www.mountainclubs.org for training options. Avalanche Safety – take a course. Learn how to assess avalanche conditions and conduct an avalanche rescue. Check out training options at www.mountainclubs.org. See the Canadian Avalanche Centre website www.avalanche.ca for info on bulletins, weather, training and more. Be Bear Aware – make noise when traveling through bear country. This is your best defense against a bear encounter. Also, keep a clean camp, do not cook/eat near your tent, and hang your food where possible. Carry bear spray & bear bangers and keep readily accessible. Be aware of how far the bear spray projects and how to use bear bangers. These same tools could be useful for a mountain lion encounter as well. Be Considerate of Others – do not crowd others while camping, rafting, kayaking, fishing, boating, hiking, biking, quad riding, dirt bike riding, driving or 4wheeling. Slow down when passing others. Keep your noise down. DO NOT LITTER. Check out www.adventuresmart.ca for more information on outdoors safety.